It is easy to understand how cells are produced from preexisting cells. And it is possible to imagine how space dust condensed to form inanimate planets. But what stumps most people is how inanimate matter suddenly formed the first living cell. This problem has vexed scientists and philosophers over the millennia, but recent research has cracked open this black box that is the origin of life. 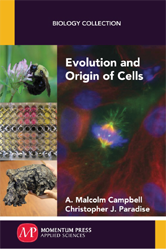 After formally defining evolution, this book presents the modern classic experiments that show how abiotic molecules can be formed from inorganic starting materials.